Those are beautiful ceramics. I admire the craftsmanship. Thanks for sharing an interesting background about ceramics. 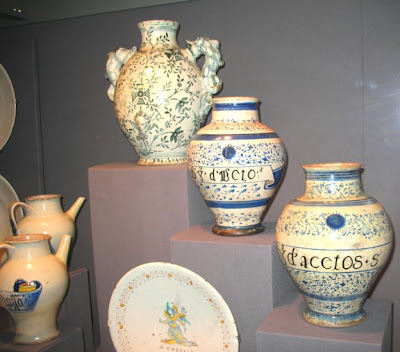 There are some family ceramics with my father’s name in the museum where my family live, they are light brown with white writing on and big handles, similar to the ones in the pic. I’m not sure of their value. What a coincidence – I just spent the morning at our local potter’s studio looking at his newest creations. I very much like ceramics, particularly things that are actually used or have been in use before. Thanks for sharing your experience on the tour and the many interesting photos. The Aristocracy were often bled in the middle ages, in the belief this was good for the body. This is also the origin of the bizarre treatment of leeches for so many illnesses. I LOVE “Salt”…and I’ve read most of Kurlansky’s books now. “Choice Cuts” was a fun read, even if he just edited it. JMB, that salt dish is exquisite. All my favorite colors as well. I will have to check out that exhibit. It looks really interesting. My mother had a small collection of little salt cellars, with the tiny silver spoons. She didn’t like salt shakers. But JMB – he’s a man and we can’t have any of them praised here! Ceramics & china they are wonderful to collect and bveutiful to see at the many museums around the world. 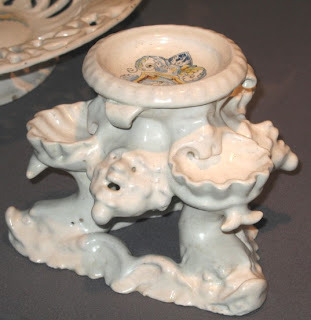 While not as adorable as the salt cellers you show here I have been lucky enought o have been able to show my collection of Vintage china at the very impressive Melbourne Museum here in Australia. I have enjoyed very much visiting you here at your blog today. Fabulous post. I would love to have been on that tour! I am fascinted by salt cellars so was interested to see these. 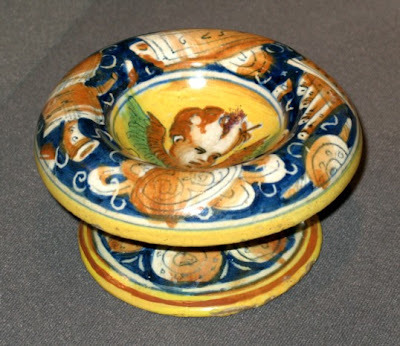 And the last picture looks veryn much like Sicilian pottery! Looking forward to the next post about this tour. I’m glad you enjoyed the post. Have a great week. That must be very special for you when you go to visit. Did he loan them to the museum? I think everyone likes pottery and ceramics. Usually the glazes are so interesting and often the shapes. Bleeding was a very strange practice wasn’t it? The use of leeches in modern medicine is amazing but frankly it creeps me out for I hate them. A whole museum of chamberpots? I’ll bet some of them were very beautiful. Munich is one of my favourite cities but I haven’t been there in years. I thought Salt would have been better edited down somewhat but there was another book of his that looked interesting as well. The salt shaker is a quite recent invention. I suppose it is a better distributor but the little dishes are wonderfully attractive. I don’t know how I have a reputation with you as a man hater when I am just a moderate feminist. Walter Koerner was a wonderfully philanthropic person. Thank you for dropping by and telling me about your collection. I visited you today too. It is a great collection and I’ve been before but this was the first time with a guide and from this point of view. I’m glad you are enjoying this series. It’s just a taste of the collection really.